How does a pump turn on with a one second time step? 4. The pump in a short period has a constant flow as the head gain across the pump stays constant. 5. The pump has small spike at the beginning of the pump event due to the changing of the pump head gain. It shows the major components of the SWMM5 solution (gravity, time, inertial, friction and entrance/other and exit losses) and the connection between Storage Area of the Node and the Area of the Node associated with the connecting links. In my description of the solution here http://www.swmm5.net/2013/07/st-venant-terms-in-swmm-5-and-how-they.html dq1 is Friction, dq2 is gravity, dq3 + dq4 is inertial and dq5 is losses. Anyone else notice almost all the presentations come back to water? GIS is cool, but Water is cooler! #EsriEPCMe: Runoff and Wastewater are also cool! 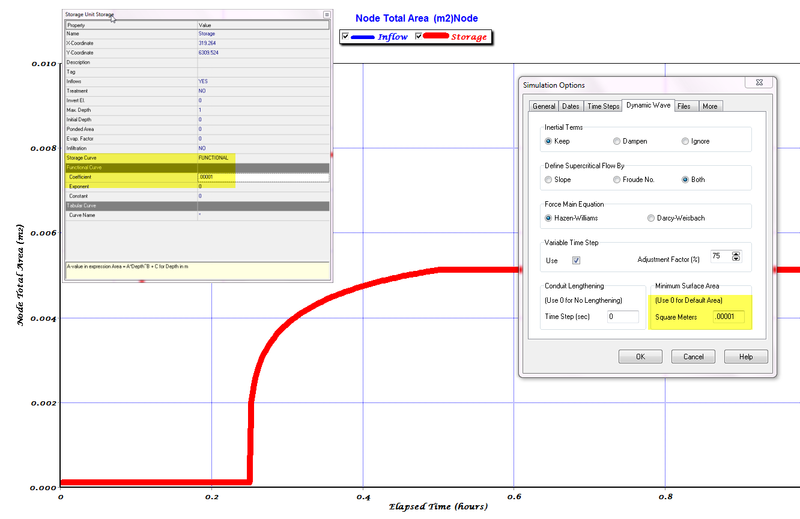 The minimum surface area in SWMM 5 is intended for manholes that have a gap between the Node Invert Elevation and the Lowest Connecting Link Invert but it also has other uses in simulation. If there is a gap the minimum surface area is used to prevent a divide by a zero surface area in the node continuity equation. 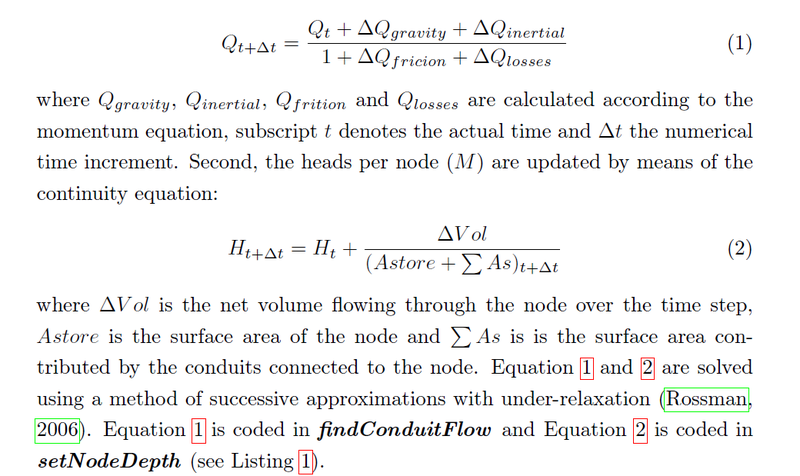 In the case of very short links where the area of the links added to the node surface area is less than minimum surface area then the area used is the minimum surface area. 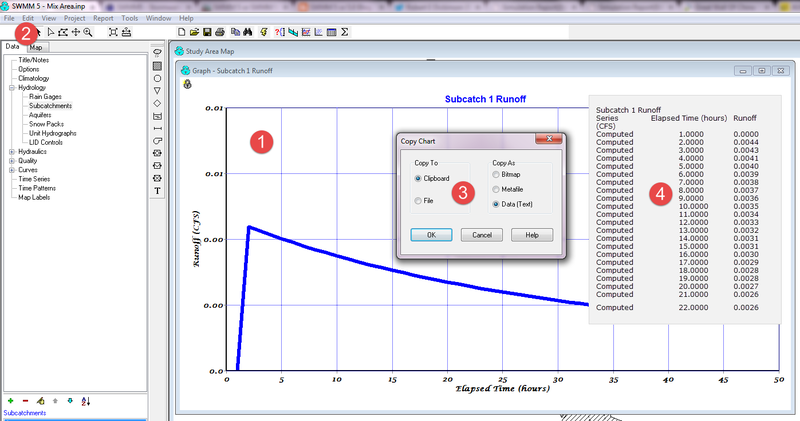 If you want the SWMM5 engine to essentially ignore the minimum surface area then set the area to a small value in the Dynamic Wave Tab of the Simulation Options Dialog (Figure 1). This applies equally to the both Manholes and Storage nodes as shown in Figure 1. The Surface area for the Storage Node is set equal to the Minimum Surface Area. I wanted to discuss a slightly hidden feature of SWMM 5 that has a definite impact on flat or links with zero slope. SWMM5 uses an internal unit system based on feet and cfs even though externally you can use SI units. There is a minimum conduit drop between the upstream and downstream ends of a SWMM 5 link which is 0.001 feet. This is done so that every link has a non zero slope. However, depending on the length of the link the drop of 0.001 feet results in drastically different slopes. Here is a table of the length of link (feet) and the internal slope used in SWMM 5 based on the minimum drop of 0.001 feet. As you can see a very long link can have a very small slope which has time step issues - you need a smaller time step. A very handy tool for making those pesky long URL's shorter and easier to see on Twitter and Email. 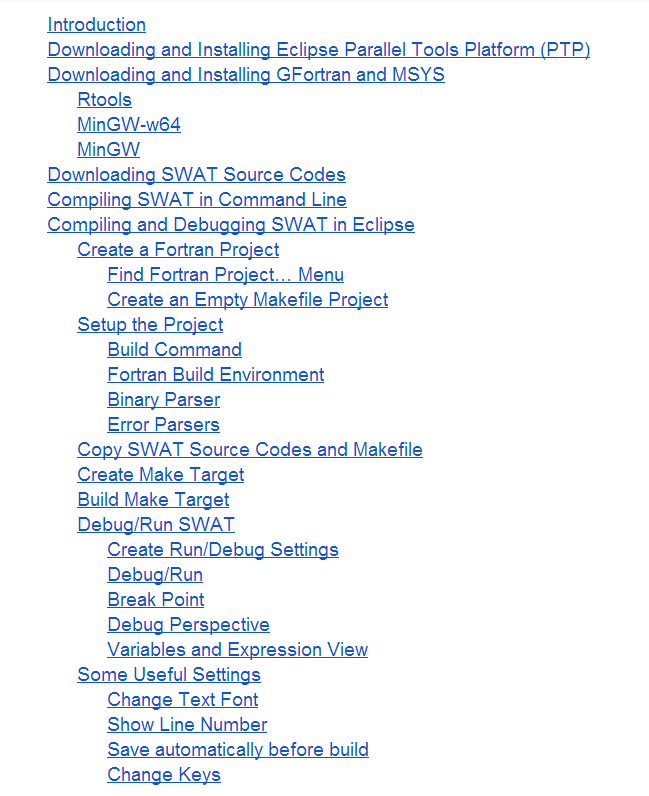 Zhiqiang Yu who is a Visiting Fellow at Agriculture and Agri-Food Canada posted an interesting link on LinkedIn called Single Document about Compiling and Debugging SWAT with GFortran and Eclipse - Please give comments with this table of contents. Personally, I am interested as I would like to modify some of the tools in SWMM 4.4 and have lost my original Fortran Compiler.